I want to tell you about Volcano Bay. It’s the new water park area that just opened up at Universal Orlando, and it looks pretty darn awesome (even to someone like myself who doesn’t normally care for water parks). 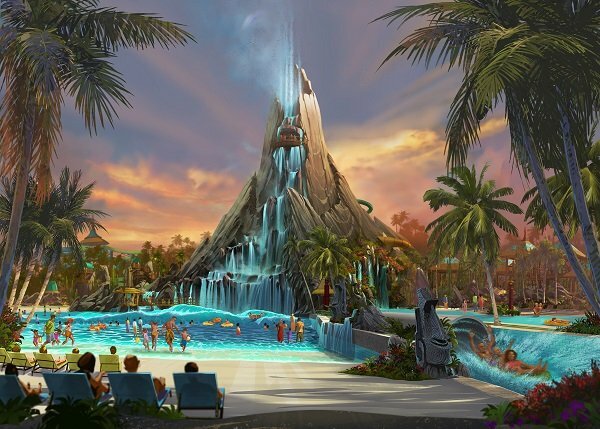 Actually, today I am out there somewhere exploring Volcano Bay, checking out the new water rides, and chilling in a cabana, but a little less than a year ago I was sitting in a hotel room staring down at the construction site and dreaming about what the new park might look like. 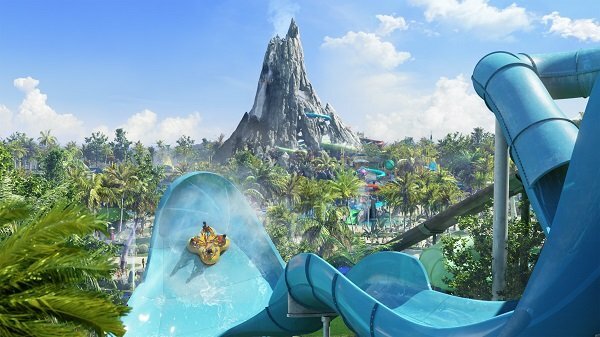 Last September, when I was at Universal Orlando as part of the Family Forward event, one of the neat “blogger things” I got to do was attend was a preview of Universal’s new water park, Volcano Bay. I didn’t know what to expect. I thought we might walk around and look at the construction of the park, or something along those lines. 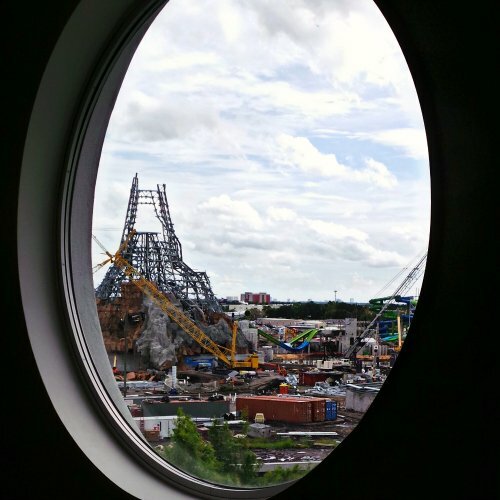 Instead, we headed to Cabana Bay Beach Resort, one of the hotels closest to the new park, and gathered in a fifth-floor hotel room chosen because it has one of the best viewpoints for looking down at the construction site. 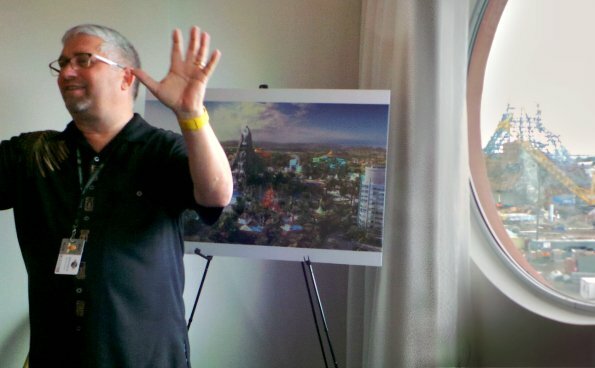 Ok, that sounds disappointing, but it totally wasn’t, because we got to meet with Dale Mason, Vice President and Executive Art Director at Universal Creative, a.k.a. the guy heading the creative team behind designing this new, heavily themed, water park. (This same gent was the head creative in charge of designing Diagon alley, and, yes, discovering that little tidbit totally did make him my new idol). Listening to this guy, someone who obviously loves his job, geek out over the fun stuff he gets to create and do on a daily basis, was a seriously fun moment. 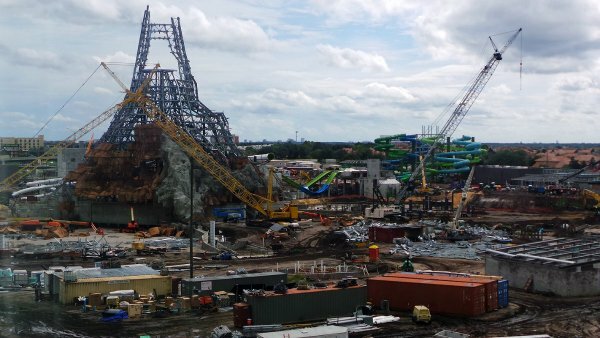 We got to hear the lowdown on the water park and we had the chance to ask Dale some questions, as we viewed a few images and stared out the window at the skeletal frame of the new Krakatau volcano. Dale gave us the background on the fictional Waturi people, telling us the folktale style story of their travel across the ocean, wandering in search of a new home. It’s a tale of travelling through various Polynesian islands, adapting parts of each culture for their own, until finally a magical golden fish appears and leads them to Volcano Bay. Waturi philosophy — Water is Life : Life is Joy. He also told us the story behind the Krakatau volcano. Once upon a time the fiery god, Krakatau, lost his temper when his daughter dared fall in love with a local boy. In a fit of rage he banished the boy to the night sky, where he became the moon. The daughter cried so much her tears formed a river. His heart softened by his daughter’s sadness, Krakatau pulled the earth up to met the sky, thus bringing the two lovers together again, and also forming the iconic volcano that is central to the park. At the same time the god pulled out his anger, and locked his rage away inside the new mountain, where it became the fiery spirit Vol. Supposedly, somewhere in the heart of the Krakatau Volcano, visitors to Volcan Bay can come face to face with the fire spirit Vol. I am eager to explore the park and discover how all these little thematic details play out. Plus there’s that whole Tapu Tapu thing, a wearable bracelet that allows you to queue up virtually, while wandering around and enjoying the park. One of the things that struck me is how convenient to the new park the Cabana Bay hotel must be. If this was the view from the window ports last Fall, I can only imagine how awesome it must look gazing down from those same spots now. I wrote this post before I left for Florida, and set it up it to publish on the day I would be visiting Volcano Bay. My family has never been to a water park before. We aren’t big on slides or water rides, so it will be interesting to see how much we enjoy this new highly themed water park. I will, of course, be reporting back with a detailed review, once we’re back home. In the meantime, if you check out my Instagram feed today you should see some cool pictures of what the park looks like now that it’s open. Disclosure: My family paid to take part in Family Forward 2016 and 2017. We would like to thank Family Forward, Mom It Forward, Universal Orlando Resort, and Loews Hotels for the many special perks and behind the scenes moments we were treated to. We see a lot of condos and buildings being built now and then but it’s not everyday you get to see a water park being built! So neat! Thanks for sharing the experience! Univeral is a super fun place. I don’t even really care for water parks, but this was still fun.